When Melanie Zook signed up for a first-year writing-intensive seminar called Marriage Inc. her freshman year, she had low expectations of the course, in which literary and cultural representations of marriage are discussed. “I expected it to be pretty dry,” she said. Now a sophomore, Zook highly recommended Marriage Inc. to freshmen a few weeks ago as their O-Week adviser. The Center for Written, Oral and Visual Communication is on the second floor of Fondren Library. Zook said that not only did she improve her writing and enjoy the class, but throughout the school year she made several trips to the Center for Written, Oral and Visual Communication (CWOVC). “Whenever I was working on a paper, I met with a consultant at the center to get a fresh pair of eyes on what I had written and find out if I was communicating what I wanted,” she said. 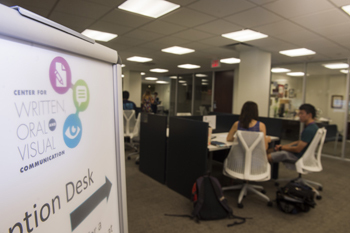 Such clarity in communication is one of the reasons Rice began requiring freshmen to take a writing-intensive seminar last year and opened the CWOVC on the second floor of Fondren Library. The center and the writing seminars are overseen by Tracy Volz ’01, who became the director of the Program in Writing and Communication in July. Volz has been teaching English and professional communication at Rice for two decades, most recently as a senior lecturer in professional communication for the Rice Center for Engineering Leadership at the George R. Brown School of Engineering. She is passionate about making sure that Rice students can communicate effectively. Volz knows from her many years of teaching that students can learn to become better communicators, and she’s particularly sympathetic to the needs of international students for whom English is a second language. This year the CWOVC is offering two English-as-a-second-language courses for international graduate students, both for credit. The fall course focuses on oral communication skills in an academic environment – how to talk to a faculty adviser, interact in the classroom or lab group and give effective presentations. The spring course will concentrate on academic writing skills at the graduate level. The CWOVC also offers workshops, courses and one-on-one consultations to help all students make their written, verbal and visual communications clear, well-organized and persuasive. Topics for workshops and courses have ranged from writing effective research reports and presenting scientific journal articles to sending professional emails and improving clarity in academic conversations. Many of the one-on-one sessions at the center involve feedback on a paper the student has written. Students can also get help with their oral presentations. The center is equipped with a room in which students can record their practice presentation; students can get real-time feedback from a peer consultant, and they can watch the recording later at home, too. “Getting feedback on one’s writing or speaking is essential,” Volz said. “You can be given lots of opportunities to give presentations, but if you’re not given constructive feedback and held to high standards, you don’t necessarily get better at it,” she said. Volz believes it is important to build on the communication skills students are taught in the first-year writing seminars and in the CWOVC. The next step will be to pilot a few communication-in-the-disciplines projects. Based on success she has had collaborating with the Department of Bioengineering, Volz plans to work with faculty in other departments who are interested in integrating written, oral and visual communication in their courses. The CWOVC is already assisting faculty who want to expand the communication instruction students receive in upper-level courses in their majors, as well as in the first-year writing-intensive seminars. Helena Michie met with a staff member at the CWOVC to review her syllabus for the Marriage Inc. course and make some revisions. “I was grateful to them for helping me with the puzzle that is a writing-intensive syllabus and especially for helping me think through assignments that scaffold writing and communication skills,” said Michie, the Agnes Cullen Arnold Professor of Humanities and professor of English. Through the CWOVC, Michie also conducted a workshop on grammar for faculty from other disciplines across campus. “It was a privilege to share my experiences and help colleagues identify and name some common writing problems they’ve encountered,” she said. Just as Zook recommends Marriage Inc. to other students, Michie advocates to other faculty that they should teach a first-year writing-intensive seminar. Faculty who are interested in teaching a first-year writing-intensive seminar or a communication-intensive course can contact Volz at tmvolz@rice.edu or 713-348-6192. For more info on the Center for Written, Oral and Visual Communication, including hours of operation and scheduling an appointment, visit http://cwovc.rice.edu/.